Balance Body & Soul Nutrition // Health Tips Blog // To Market We Go! Summertime is here, and that means it’s time for us to strip off our winter layers and head outside to enjoy the nice weather! One of the easiest ways to get outdoors this summer is to put on your sandals and shop around your neighbourhood. Farmer’s markets are one of the best places to do this as it’s usually one-stop shopping for produce, farm-fresh meats, baked goods and other locally produced items. There are many benefits to buying your food at a farmer’s market, and nutritional value definitely ranks up near the top. Produce at the market is fresher and picked at its peak meaning that very few of the valuable vitamins and minerals have been lost over time. Food begins to lose its nutritional value as soon as it’s picked as vitamin stability is affected by temperature, exposure to air, and light conditions. The produce you find at a farmer’s market is usually picked one day and sold to you the next maximizing both its taste and nutrient content. There are also environmental benefits to buying more locally produced food. Food from local farms travels less distance which reduces the use of fossil fuels offering protection to our fragile environment. As well, though it may not be certified organic, food that is produced locally is typically produced in a more sustainable manner as it is being grown in a suitable climate. Food that is grown out of season and in conditions that are not optimal generally requires more intervention to make it grow. This can include pesticides, fungicides and other chemicals used to keep the plants “healthy”. Local farmers will often be able to grow their produce with little or no chemical support and will be happy to share this information with you. Though they may not be certified organic, many of these farmers grow without the use of pesticides and practice sustainable farming. Which brings me to another important benefit of farmer’s markets in particular; there is a wonderful connection you can make with the people growing your food. Shopping at a farmer’s market is more than just an act of running errands, it is a social experience. As a society we have lost a connection with our food because we are no longer growing most of it ourselves. Buying it directly from the farmer gives us a chance to make that connection again. If you have questions about growing practices, freshness, varieties or taste just ask the person in front of you because they are the expert! If you’re trying to reduce your exposure to pesticide residue, start asking the farmers questions and about how they grow their produce or raise their animals. 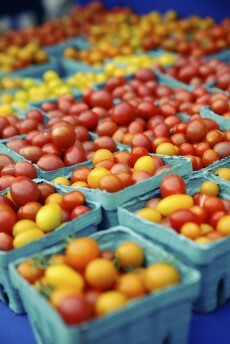 It’s true that shopping at a farmer’s market can sometimes cost more than buying from a traditional grocery store. Good health and good quality sometimes comes at a higher cost. But if you weigh the benefits of fresh food over not knowing how long something has been sitting there waiting to be purchased the choice should be clear. The sad truth of it all is that if we don’t support our famers than they won’t be able to continue to protect our valuable farmland. One day we may even lose the ability to produce our own food and be forced to import all of our produce from far-flung locations. Shopping locally will connect you with the seasons and offer you variety, flavor and nutrition that can only be beaten by growing it in your own backyard. 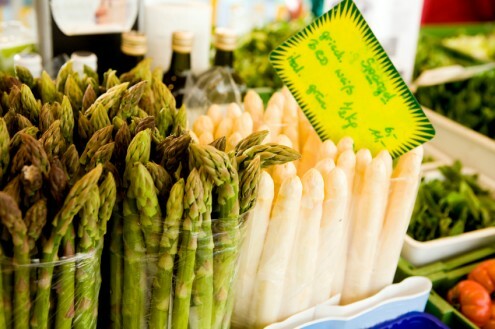 If you live in Ontario, check out Farmers’ Markets Ontario to find a market near you. So, grab your sunglasses and your bags and head out to see what your local market has to offer you this week!